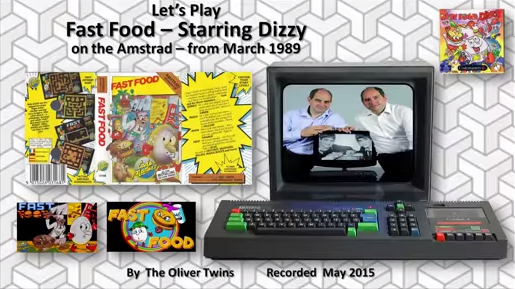 The Oliver Twins play another one of their early Dizzy games on the Amstrad. Andrew and I play Fast Food from 1989, 26 years ago! This was our first non-adventure Dizzy game and was very successful. We wrote the Amstrad CPC & Spectrum versions and it was converted to Commodore 64, Atari ST, Amiga & PC (MS DOS). Yes. While I loved the game as a kid (Amstrad version) it frustrates me today how slow it is. I don't think I actually had Fast Food when I was a kid. I know I played it but it wasn't mine. I did have Kiwk Snax tho which I preferred, but the game I played most in the collect-em-up genre was Fruity Frank. And Haunted Hedges, which was a lot closer to Pac Man.